​The executive transition process has three essential stages. In his seminal work on the topic, Tom Adams describes these three stages as prepare, pivot and thrive. Most people only think about the middle stage – the search for the new executive. Yet the first and the third are really the underpinnings of helping a new executive succeed. They prepare the organization grow and learn through the transition. I am going to explore the first stage in this post – “getting ready”. ​A key first step to managing a key leadership transition is to get organized. The board needs to appoint a transition team. Team members should be able to think bigger picture and longer term for the organization. Recruit for a variety of skills including strategic thinking, emotional intelligence and project management. Decide whether the team will consist of only board members or might include some staff leaders as well. ​Should we continue as we are? Don Tebbe, a leading expert in leadership transitions, urges all nonprofit organizations to consider a key question before getting caught up in the details of managing a succession process. Should we continue as we are? Where do we stand in terms of the organization's mission? What has changed in the landscape since we last chose an executive director? Is our organization, with its current programs and services still relevant? Or should we consider closing down? Or is a new organizational form needed? Should the organization consider merging, being acquired or some other strategic restructuring? This team will need to address both the needs of the departing executive, the needs of the board and the needs of staff. Transitions almost always create some anxiety in the organization. Just pretending that people are not having the emotions they are having about the upcoming changes does not actually make them go away. The team should plan on educating themselves about the types of emotions that people typically experience when going through these kinds of changes. A consultant familiar with leadership transitions can also help normalize this experience. ​Another key consideration it to get clear about what role staff will play in the search process if any. It is important to clarify expectations, especially if staff are involved. Are staff involved simply for their comfort? Will they have input on the decision? To what extent? Who ultimately is responsible for making the decision about whom to hire? As the team thinks about how to involve staff, they will also want to talk about their approach to retaining key staff. ​Thinking about your communications plan at this stage is also important. Who are the key stakeholders who need to know about the transition? How will you let key funders know? When and how will they be informed? Considering whether it would be helpful to have a consultant guide you through the process is an important conversation. A coach for the departing executive, especially if they have been in the role for a long time can be helpful to help them let go and think about their future. The consultant when hired often plays this role as well. Would the organization be better served with an interim executive instead of jumping immediately to a permanent hire? ​During this preparation stage, you should conduct an organizational assessment. This is a piece that is particularly useful to have outside consultant help. What are the organization’s strengths, challenges, direction, and priorities? Often this review will consist of board, staff and stakeholder interviews and surveys. As part of this review, you may find that the organization needs to be stabilized and key deficiencies identified in assessment process need to be addressed. Do not leave these for the new executive director to fix. When the deficiencies are substantial, an interim director can be particularly helpful. ​After the assessment is complete, hold a leadership strategy session. This session should not be designed to tackle a full blown strategic planning process. Topics would include answering questions, such as the following: Is board clear about strategic direction? What does the organization want/need in a new executive director? What are the priorities for the first 12-18 months? What are the issues to be addressed before new executive director is on board? Facilitating this session is another place that is helpful to have consultant support. A final task in the preparation stage is to create a search plan. Need help thinking through how to get started with a leadership transition? Reach out for a coaching call. When does it make sense to hire an interim director? ​When an organization is going through a leadership transition, one of the questions that is useful for them to consider is whether they would be well served to have an interim before they hire the new executive director. An interim can serve as a bridge between the old and the new. ​There are many reasons to consider hiring an interim before launching into the full search process. It is especially useful after a founder or a long-term executive director (generally anything more than 7 years). Hiring an interim creates some space. It allows people to more naturally move through the phases of transition. By creating some separation between the former executive director and the new leader, the organization – staff and board -- can start separating the organization’s identity from the former long-term executive director. An interim director brings fresh eyes and can question how things are done. An interim director does not have the same stake in the outcome as a new executive director and thus can take some risks. An interim helps facilitate conversations about former leader’s strengths and gaps. The organization can then celebrate achievements, identify what parts of the legacy should be preserved, and also start to do things differently. An interim often is able to identify hidden staff talents and potential. The interim director sometimes will also provide a bridge to new executive and even continue as mentor, helping with entry and a successful launch. ​Interim directors have the space to “tell the truth” to the board. They will likely conduct an organizational assessment. They can be very helpful with addressing key organizational issues, including cleaning up messes. By taking this action in an interim period, it can better set the new executive director up for success. This allows the new executive director to come in and focus on the future. ​Hiring an interim leader helps slow things down. By doing so, the board and staff have the time and space to think strategically and do a thorough search process. Too many organizations rush into a new hire. The new executive director comes in but does not last long because the organization was not fully ready to accept a new person. The quickly departing new executive director thus becomes an ‘accidental’ interim director. You will be better served with being intentional about this and gaining the benefits on an experienced interim. There are consultants who specialize in taking interim roles. Many have been executive directors in the past. Many have been interim directors multiple times. Because of the benefits this brings, the field has now expanded to include interims for all the C-suite roles. While it may seem expensive in the short term, this option has many long-term benefits. ​For the past 20 years, I have been reading about the impending leadership transition in the nonprofit sector as the baby boomers begin to retire. Work in this area has typically focused on a feared leadership gap. Economic realities have delayed this generational shift for years, with many leaders delaying their retirements. Yet it seems like this shift is finally here. At many of the clients I have worked with over the past couple years, the leader is planning to retire in the one-three years. ​Yet even without this large generational shift, organizations manage leadership transitions all the time. A June 2015 survey by the Bridgespan Group found that 43% of organizations had to fill a C-Suite position in the previous two years. During a webinar hosted by Nonprofit Quarterly in 2017, the speakers noted that research shows that nine percent of executives turnover every year. Leaders may be leaving for a new role or a new organization, for retirement or because they were asked to leave, as well as other reasons. In working with leadership starting to think about moving on, I have struck by a fear they seem to have in common. When we talked, each emphasized – sometimes multiple times - not to mention anything to staff or board members. Though this is on their mind they are very anxious to not share this information with whom they work. I worked at one organization at which the leader was already over 70. Yet mentioning this at a meeting or talking about when they might retire – even when planning a celebratory event several year out – was strictly off the table. Certainly leaders want to manage this communication carefully, thoughtfully and on their own time line. Yet what they may not realize is that their staff is likely already talking about it. Conversations with each other likely include some speculating about the leader’s plans. So just because a leader has not made any formal announcement, don’t assume staff and board are not wondering about when it will happen and having sidebar conversations about this. ​This fear about addressing the issue likely comes from a variety of sources. And transitions of all sorts are challenging. Some of the most helpful work in this area that describe the emotions that people experience when going through a transition is by William Bridges. 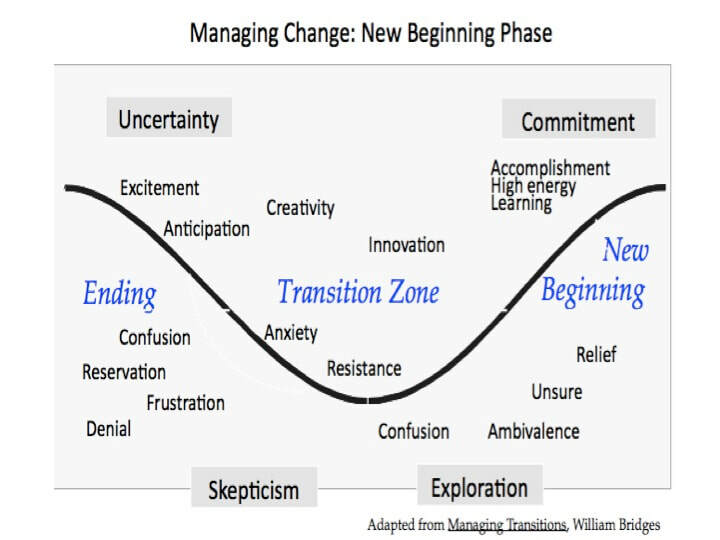 His book Managing Transitions describes three phases – the ending, the middle or neutral zone and new beginnings. In our action oriented culture most people want to jump from the ending to the new beginning and skip right over the in between and nebulous space of the neutral zone. Yet our lives don’t work like this. Going through a transition means experiencing that in between -- not quite here--not quite there-- space. Anthropologists call this a liminal space – the space in between. It’s the messiness of the emotions involved in the ‘in between’ that most of us would rather skip. The diagram below shows the typical emotions people experience as they move through a transition. Facing a leadership transition and need help thinking about how to get started? Inquire about a complimentary coaching session.